The Goodies Co. 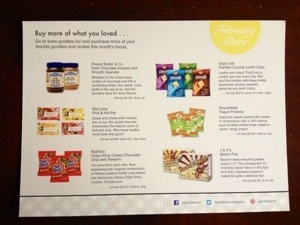 Box is $7.00 a month, including shipping, and contains a variety of full and sample sized snacks and food products. 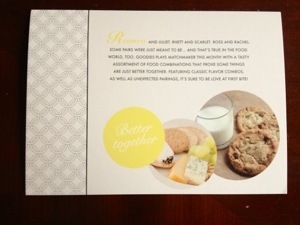 It can take 4-8 weeks to receive your invitation once you submit your request, but it is definitely worth the wait! WooHoo! My first Goodies Co. Box is here! The very helpful product information sheet! 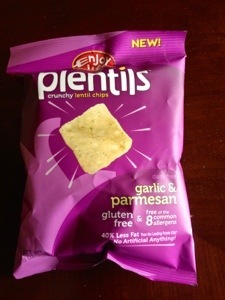 These were definitely crunchy. The flavor was a new experience, not bad just different. 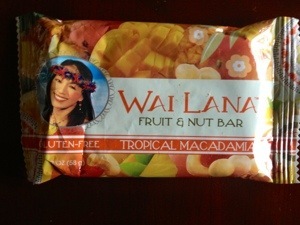 This was yummy and very reminiscent of Aloha! We will be buying more! 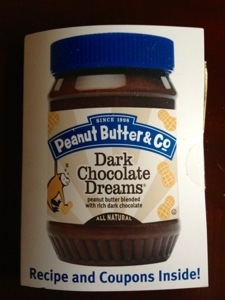 This had the classic combo of chocolate and peanut butter, but with dark chocolate – nice! 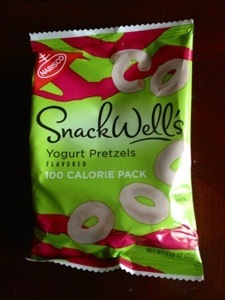 Pretzels and yogurt, the pouch was conveniently handbag sized and at 100 calories is not a bad thing to have around. 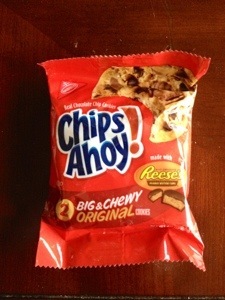 Very chewy just like I remember from childhood, the Reese’s are an addition that took way too long to happen. 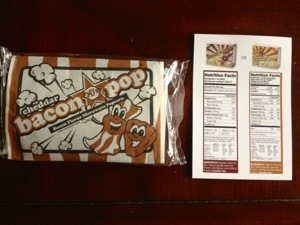 We have not tried this yet, but recently tried another brand of Bacon flavored popcorn that the Husband loved so we have high hopes! The approximate value of this month’s Goodies Co. Box is $7.43, That is just above the price I paid, but seeing that shipping is included it is a good deal! 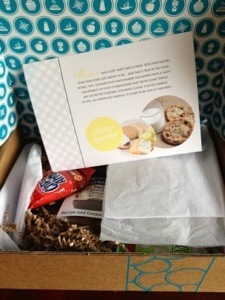 Overall I am happy with my subscription and look forward to next month’s box.